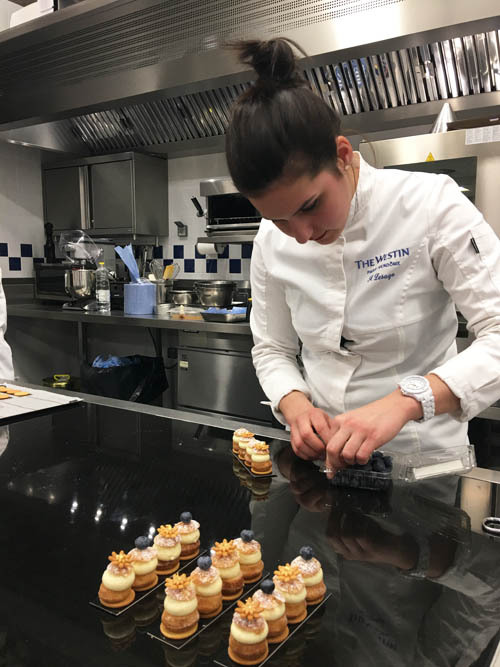 On February 1st, we welcomed chef Florence Lesage, women pastry chef, runner-up in the pastry/confectionery World Championships, silver medallist at the final of the 2015 Worldskills competition in São Paulo, and pastry chef at The Westin Paris-Vendôme’s Le First restaurant. She works alongside David Réal, Executive chef at the helm of all the hotel’s kitchens. This young, 23 year old, pastry chef has a dazzling background: after taking a Food BEP (Certificate of Vocational Proficiency), specializing in pastry, confectionery, ice cream and chocolate, she successfully passed her professional Food baccalaureate in pastry. She continued her studies with a Brevet Technique des Métiers (Vocational trade qualification) in pastry, confectionery, ice cream. In 2016, she rounded off her education with a Brevet de Maîtrise Pâtissier (Pastry chef Certificate of Proficiency). Florence Lesage was awarded gold medal at the regional trials of the Olympiades des Métiers in Compiègne in 2014. She trained for the various tests at the competition with complete dedication, like a top-class athlete, enabling her to go on to win the national final in Strasbourg in 2015. “I really love simple things and straightforward flavours: vanilla, chocolate, hazelnut, coffee, fruit ... As is often said, the simplest things are often the most difficult. The opportunities in this profession are endless. There is so much to learn, both in terms of product knowledge and the technique itself. Being a pastry chef enables you and those with whom you work to express themselves. We all have different tastes and ways of looking at things and it is always interesting when we share our ideas. The way we each add our own input in my team is amazing”. knowledge transfer is fundamental in our profession. I really enjoyed giving this demonstration at Le Cordon Bleu Paris institute because it enabled me to share and transfer my knowledge to the students.